By now, I am sure that most of us have seen the 1997 James Cameron blockbuster movie Titanic. It is a very good movie and is a nice more modern version of the Titanic's sinking. This 1953 version of the Titanic has pushed aside the newer version and has claimed a spot in my heart. 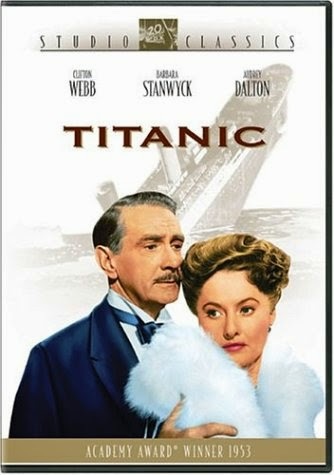 The 1953 Titanic had a wonderful cast with Clifton Webb, Barbara Stanwyck and a young and handsome Robert Wagner. This movie really focused on the people on the ship, the relationships and their feelings. I became enthralled in the problems that Julia (Barbara Stanwyck) and Richard (Clifton Webb) had. I could feel for Julia and was wanting things to go her way. When the Titanic hits the iceberg, their big problem suddenly seems very minor! When it came down to the band playing Nearer My God To Thee, I got goosebumps. The song was just so ominous sounding and made my eyes tear. I felt as though at that moment, I could put myself in the shoes of those people. The movie is a wonderful version and it is something I will be watching for years to come. My mom always told me that sometimes old movies are better. She was certainly right about this one! Great review! Haven't been able to see this one yet!